Social media has changed the way we live, reaching people that we never thought possible so it’s somewhat surprising that 60% of Fortune 500 CEO’s are still not active on social media and of those that were, only 54 of them were active on 2 platforms. That’s a pretty large amount of CEO’s from some of the biggest and best companies in the world not engaging with their customers, suppliers or teams. There’s no doubt there are some challenges to adopting social media and CEO’s are no different from the rest of us when it comes to those concerns including perceived potential risks, the time and effort, their own lack of knowledge on how to be effective and unfortunately, whether it actually adds any value. Fortunately there are a number of CEOs and business leaders who 100% believe in the efficacy of social media in amplifying their reach and improving customer and employee engagement and of course, the positive impact on their own personal branding. Richard Branson, Jeff Weiner and although not one to follow if you are easily offended, Gary Vaynerchuck are a few of my favourites; showing they are real people as well as great business leaders. In this digital world where influencers can have enormous impact on brands, having a social CEO who has developed their personal branding to influencer status, can be a major advantage, growing brand credibility and popularity as well as engaging customers and employees across the whole company. Social media allows execs to connect with their teams in a more authentic and human way. When the majority of employees are already active on social media, being present online and showing their own personality drives engagement across the company. CEOs and business leaders can keep a ‘finger on the pulse’ of how the company is feeling and potentially pick up on issues, and successes, that might not otherwise reach their table, enabling them to both rectify challenges but also celebrate and recognise individuals. It works the other way too, employees who may not ordinarily have been in contact with the senior team have a way of reaching out, even if it just to build a relationship and connect as one person to another; we all know that employees feel more engaged when they have a voice and are seen as a real person. Their connections and often, diverse, networks across industry and professions can drive reach in segments that may not otherwise be accessible. This can often mean that a social CEO can be influential with local and possibly national, ‘policy’ makers who can impact their industry. As with internal benefits, a social CEO can tune in to what is really happening with their customers and their industry. They are able to spot opportunities and resolve a possible crisis by active social listening and engagement. A socially active CEO/C-Suite both attracts and retains talent with 80% of employees saying they would prefer to work for a social CEO. Millennials in particular, embrace the digital world, watching more YouTube than TV and although I’m not expecting to see many CEOs on YouTube any time soon, they certainly should be active on social media to reach employees. Today’s buyers are active on social media and when nearly 60% (or higher depending on what report you read!) is completed online, studies have shown that a social C-Suite, and particularly the CEO, helps further drive trust, brand perception and reputation. 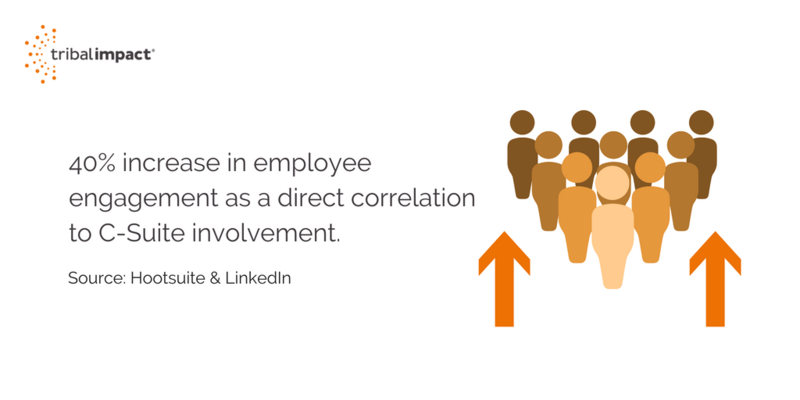 If you want further evidence on why a social CEO drives employee engagement and reach, take a look at this research carried out by Hootsuite & LinkedIn: they found a 40% increase in employee engagement as a direct correlation to C-Suite involvement. In light of the positive benefits of a social CEO and that the risks and concerns of CEO’s getting active on social media can be effectively and efficiently managed, there really is little reason for more leaders not to get on board. Given that it’s predicted by next year there will be nearly 2.8billion people active on social media, I’ll leave you with a quote from Ryan Holmes, CEO at Hootsuite which sums it up pretty well.